Fiskumvannet at Vestfossen was the chosen venue for a traditional kayak gathering 8th -10th September 2006. Some 40 kayakers from home and abroad gathered for a somewhat different arrangement. Home made skin on frame kayaks were dominant with the occasional boat in more modern materials. 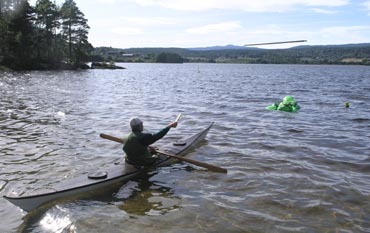 The majority of the enthusiasts had made their own boats and willingly shared experiences with building techniques and refinements. Traditional paddling and rolling techniques in difficult conditions were also competed in along with harpoon throwing. But there was more than just competition, food and drink and a fantastic slide show showing paddling between enormous icebergs in Greenland awoke fond memories in some and inspiration in others. A grateful audience willingly shared ideas and tips for future trips. In addition to this, several mini workshops were held, from assisted rescues to more advanced rolling techniques. There was something for everyone! And the reason for the gathering? 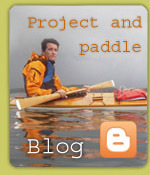 â€“ â€œKajakkspesialistenâ€� Anders Thygesens 10 year jubilee as a kayak builder at Vestfossen. 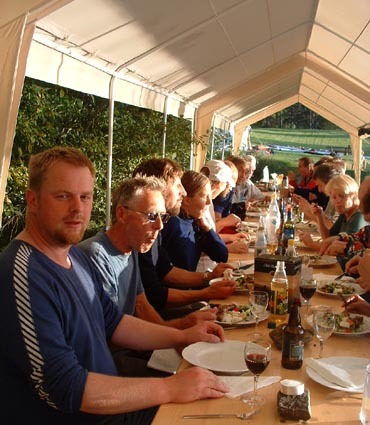 There were many who wanted to show their appreciation to Anders who through his work has generated so much pleasure to new and old kayak enthusiasts. Anders has been involved in building over 500 skin on frame kayaks during this time, and some people just cannot get enough. Some builders at the gathering had built several kayaks and experimented with designs and sizes from various Arctic regions to build exactly â€œthe kayak of their dreamsâ€�. The great thing about the gathering was the laid back atmosphere. We relaxed and did as we wanted, both adults and children. The youngest competitor was just 14, and plenty of even younger children were on the water during the gathering. The older generation of 70 plus were also well represented and were very competitive. â€œI hope its not 10 years until the next oneâ€� was a typical comment and with the high level of enthusiasm it will be interesting to see if the gathering can be a yearly event.